Melville Castle in Edinburg, Scotland on a rainy cold weekend was absolutely one of the highlights of my career. There was romance and drama virtually dripping from every single second of this incredible wedding weekend. I met Romilly and Adam at Romilly's sister, Tamsin wedding in Asheville, NC. Tamsin and I had become incredibly close throughout the run up to her destination wedding at The Camp. And then I met her equally charming and beautiful sister Romilly. At the end of an absolutely epic shoot, Romilly approached me about coming to Scotland for her wedding just a few short months later. To be able to shoot the weddings of both sister is such an incredible honor and to shoot both of them in two epic locations... Just wow. When we arrived at Melville Castle, it was like stepping back in time. The rooms were luxurious and gorgeous. The art throughout the castle was incredible and the perfect backdrop for the various portions of the shoot. On our first day, we met Romilly and Adam for a simply divine engagement session. It was cold, windy, slightly rainy - basically your "soft" Scottish weather. The wedding day's weather was no different but I'm not complaining. 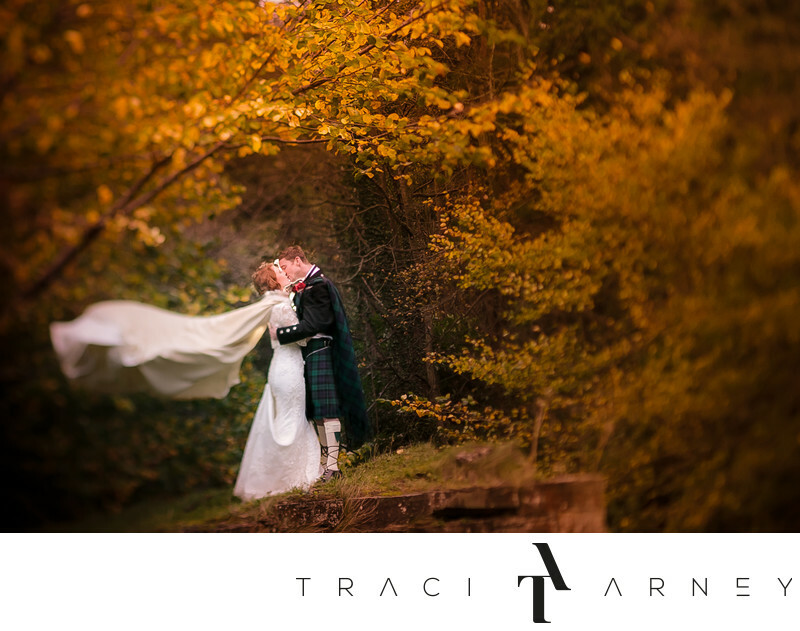 When we went to do their romance session after the wedding, Romilly's cape was dancing in the wind, her hair matched the autumn color of the leaves and her Adam was in his full Scottish regalia including a tartan kilt and his dress daggar sgian-dubh. Keywords: autumn (9), cape (9), Castle Wedding (3), Destination Wedding (186), Edinburgh Scotland wedding (3), European Wedding Photographer (3), Fearless Wedding Photographer (3), kilt (3), Melville Castle Wedding (3), Scotland Destination Wedding (3), Scottish engagement session (6), sgian-dubh (3), Tilt-Shift (18). 1/160; f/2.8; ISO 640; 90.0 mm.